Brantwyn, namesake for the Brandywine River, evokes local history of the battle and a valley that influenced a history of art - Pyle and Wyeths. King-sized walnut bed including secretary and hutch, chiffarobe, upholstered chair, ceiling fan,�individual air conditioning and heat. Private en-suite bathroom including tub/shower, heater, exhaust fan, and up-to-date fixtures. High Definition Television with cable channels. Wireless, high-speed internet access. AM/FM/CD Clock Radio; DVD Player available upon request. 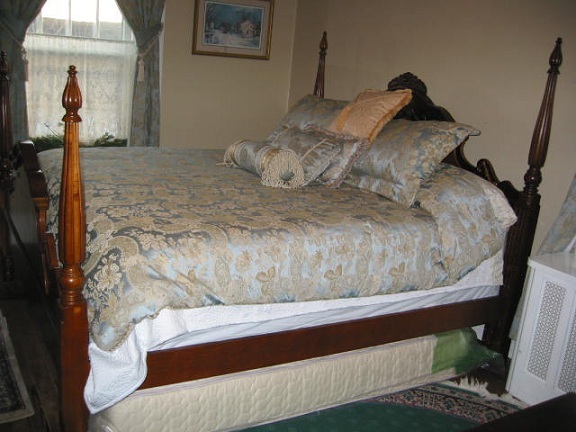 A twin size bed is available for a third person or where two beds are needed. Just wanted to forward our thanks for a very nice stay at Bancroft Manor Bed & Breakfast. We enjoyed the beautiful rooms, the relaxed atmosphere and delicious breakfast very much.